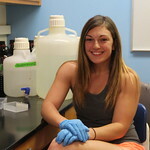 The Biology program at Westminster College offers small class sizes, professors focused on student achievement, and a transformative educational experience that prepares students for numerous career paths. Students begin with Foundations courses in the areas of cell biology and genetics, evolution form and function, ecology and biodiversity, and biostatistics. Upon successful completion of these introductory courses, students enroll in advanced courses where they explore new topics in more detail and expand on their laboratory and field skills. The culmination of the biology program is an individualized Capstone research project, which allows each student to collaborate with a faculty member as they apply knowledge and skills from their course work to a novel research project. The department also offers field and travel opportunities so students can observe and apply biological principles beyond the classroom environment. Students interested in the health-related professions can receive additional advisement by the Medical Professions Advisory Committee (MedPAC). Students interested in graduate school or research can receive additional advisement from our Research Professions Advisory Committee (ResPAC).The rigorous study of biology combined with a traditional liberal arts education provides our graduates with exceptional placement with employment and into pre-professional and advanced degree programs.